Throughout my childhood, J.R. Bookwalter and his company Tempe were making movies in Ohio, less than two hours from my hometown. It all started with The Dead Next Door (which began filming in 1986 but wasn't completed until '89) and continued with Robot Ninja, the "six pack" he shot over the course of seven months, Ozone, and The Sandman... And I didn't find out any of this was going on until the release of Bookwalter's film 1996 Polymorph, which was the last movie he directed in Ohio. I completely missed out on all of this when it was happening, but cut me some slack - I was only 12 by the time Polymorph was being filmed. It was an ad in the pages of Fangoria that tipped me off to the existence of Polymorph, and it was the ad's claim that the movie was something like "The Blob meets Pulp Fiction" that sold me on it. I was an established fan of those movies, so I had to see what it would be like if they were mixed together. I ordered a copy (actually, asked my mom to order a copy for me). The VHS tape of Polymorph was white, which I thought was pretty cool, since it was the first time I had seen a VHS tape that wasn't the basic black. Once that VHS was playing in the VCR, it wasn't long before the movie had turned me into an inspired fanboy. Reminiscent of the beginnings of films like Critters, Night of the Creeps, and Predator, the opening scene of Polymorph utilizes some micro budget mid-'90s CGI to show us a space ship ejecting a pod while passing by the moon. That pod crash lands in an Ohio swamp and begins leaking some kind of substance that quickly contaminates the water. Not far from the swamp is a cabin where a paranoid young woman named Tarper (Sasha Graham) is keeping watch over a whole bunch of cocaine and dipping into the stash to self-medicate her anxiety. When a doctor (Pete Jacelone) from a company called Parkertronix shows up with a security guard (Michael L. Raso) to investigate the "radar blip" that was caused by the crashing pod, Tarper kills both men and makes an emergency call to her pals Carlos (Tom Hoover), Franco (Leo Anastasio), and Regine (Pam Zitelli). The Blob influence is evident in the crashing pod and the substance that oozes out of it - when a character first sees this stuff, they even poke it with a stick like people tend to do with the blob. 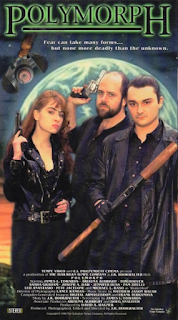 Carlos, Franco, and Regine bring in the Pulp Fiction of it all, being criminals who like to wave guns around and make pop culture references. Carlos advises Tarper to calm down by watching some Welcome Back Kotter reruns on Nick at Nite, and I remember clearly that Welcome Back Kotter was playing on Nick at Nite around the time this movie went into production because I was watching some of those reruns myself. Tarper is right to be worried that more people are going to come snooping around her cabin, because the Parkertronix doctor had called interns Bill (Joseph A. Daw) and Ted (James L. Edwards, who also wrote the screenplay) to tell them to come out to the woods as well. Not taking the situation seriously, Bill treats the trip like a camping get-together, inviting his girlfriend Alice (Jennifer Huss) along and setting up a blind date between Ted and Donna (Ariauna Albright). The potential romance between Ted and Donna gets a good amount of focus, which is okay because their interactions feature some of the best writing in the film. Donna tries to get to know Ted, but he is quite awkward and withdrawn, nursing a broken heart caused by the end of a five year relationship. Rewatching Polymorph now, after being away from it for a while, I was surprised to realize that these scenes might have had an influence on some writing I did years down the line from my first viewing of the film. The criminals and the camping interns cross paths at pretty much exactly the halfway point of the movie, and it's almost non-stop action from that moment on. When Tarper dumped her victims in the swamp that green stuff got into a wound on her leg. By the time Carlos, Franco, Regine, Bill, Ted, Alice, and Donna are in her cabin, Tarper has died and her body is taken over by some kind of alien life force. Despite the Blob comparison, this is not the story of a flesh-consuming gelatin. This body-hopping being can do things like toss around glowing green energy blasts, sap the gasoline out of a vehicle just by putting a hand over the gas cap, and bounce a bullet fired into its head back at the person who pulled the trigger. It's quite a formidable enemy, but luckily Tarper had a nice cache of weapons in her cabin. After tormenting the campers for a while, the criminals realize they have to join forces with them if they're going to have any hope of surviving and escaping from the woods. Bookwalter's days of filmmaking seem well behind him now; at the beginning of this month he even mostly shut down the physical media side of Tempe (except for an upcoming special edition release of Robot Ninja) and seems to have let go of several of the movies the company was distributing. When he was directing, he did some very ambitious things with his films - The Dead Next Door was an insane project to take on as his first feature, and Polymorph also reaches beyond what most indie filmmakers with extremely low budgets would attempt. There's a ton of visual effects, gunfire, explosions... Not what you'd expect from something like this. 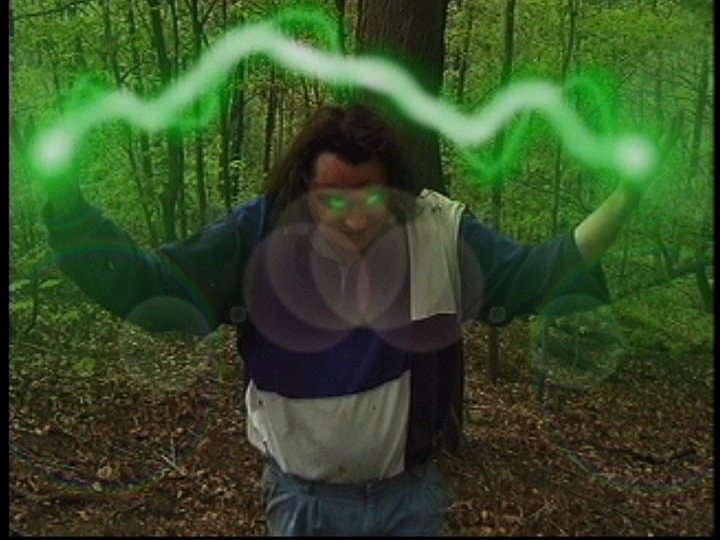 Polymorph was Bookwalter's first time shooting something digitally after a few years of shooting on VHS, and it still holds up as one of the better looking digital indies of its time. The format was probably helpful when Bookwalter decided to give the movie comic book style transitions when editing it, and while Edwards wasn't happy about that choice, I have always enjoyed it. One of my favorite aspects of the movie is the score, which was composed by Matthew Jason Walsh. There are tracks in there that hit me hard with nostalgia every time I hear them, mentally taking me back to the days of my earliest viewings of the movie. I love to hear them, even if there's a touch of sadness to it as well. This is a really fun movie, and I appreciate it both for what it is and for the fact that it introduced me to the wild world of Tempe. 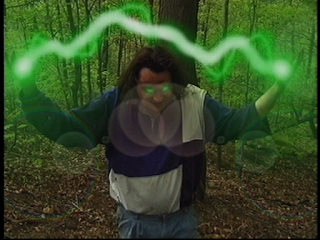 After watching Polymorph I sought out everything else Bookwalter had directed (plus movies he produced, like Skinned Alive and Bloodletting), and seeing what he and his collaborators were able to accomplish while filming in the Ohio countryside with a small amount of cash has been very inspiring to me over the years. Listening to the people who worked on these movies reminisce about those days in the special features is very entertaining, and makes me wish I could go back and visit the sets when these movies were being made. Since I can't time travel, I guess I have to make my own movies to try to have experiences like the team behind Polymorph and the other Tempe movies had.